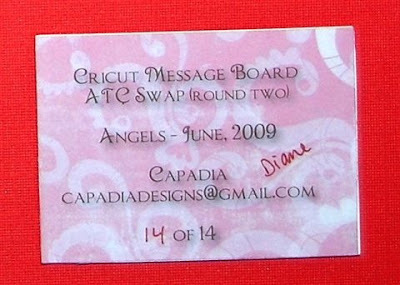 The theme for June for my ATC swap group was "Angels." This sounded so simple, but I had trouble deciding what to do and, as usual, I was rushing to get mine mailed on time. I think I will do the July ones next week and be early for once! I decided to use this angel from the Joys of the Season cartridge. It is graceful and elegant and, since I love music, I liked that she has a horn or trumpet of some sort. 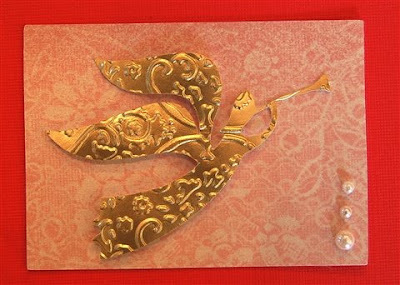 I wanted to use some gold metallic paper from Creative Memories for the actual angel cuts. This is an older paper that is no longer available. I really like it for the soft sheen it has and I am very stingy about using it since I don't have much left. 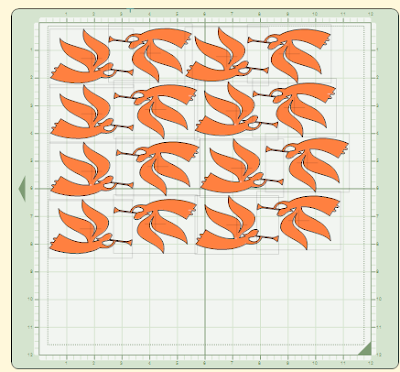 By using Design Studio, I was able to set up 16 cuts of the angel using as little space as possible. The paper is 12 x 10 so I needed to be sure that the cuts would fit in that area. I ended up with a clean narrow border strip left from the sheet of card stock (plus the "scraps" from the cuts - I can punch some stars and other shapes from these leftover pieces). I used some pink damask card stock from the DCWV "Luxury" stack for the background. It has a beautiful sheen. I cut the actual cards using a Design Studio file that I have shared before - it is very fast, easy and accurate this way.The angels were embossed using the "Textile Texture" Cuttlebug folder. I "fussy embossed" by carefully placing each angel in a certain position in the folder to get the swirls and the "halo" just right. Here are all 14 of the ATCs just before I sent 13 of them flying to Arizona to be swapped. I use my Creative Memories StoryBook Creator Plus software to create the backs of my ATCs each month. I set up the file with all the information required and then print the backs, 9 to a sheet of cardstock and trim them to 2 1/2 x 3 1/2 inches. I used some digital paper that was a little bit similar to the front of the card as the background (it is from the "Gazebo" Digital Power Pallete). I signed and numbered each ATC before sending them to be swapped. The angels were attached using foam squares for some added dimension. Three pearls - one large and two medium - in the lower right corner, give the final finishing touch. Jen and I are teaching three Design Studio Classes this week - a Getting Started class Wednesday evening at 8 p.m. Eastern time and Basic Cards on both Thursday and Friday at 1 p.m. Eastern time. If you are interested in either of these classes you can sign up through the "Let me Show you How to Do that" blog.